Pro-Tech knives are easily some of the very best made automatic knives currently on the market. Made in a production facility but then individually hand assembled for a fantastic fit as well as a high quality finished look, each one of their auto knives has quality stamped all over it. From the top quality materials used in each knife to the unique inlays that many of the knives have, Pro-Tech makes great knives. One of their most popular lines is the Godfather line of knives. An extension of this line of knives is the Godson series. The Godson knives carry the same look and feel of the Godfather knives but are constructed smaller for those who prefer a smaller knife. The Pro-Tech Godson auto knife, model PT704, is a great example of one of their many fantastic automatic knives in the Godson line. 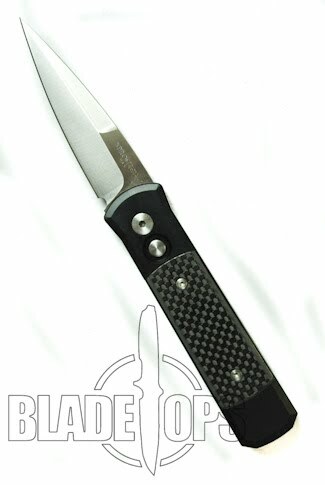 This knife has a 6061 T6 aluminum frame in black with amazing carbon fiber inlay. The trigger button, when depressed, fires a satin finish blade of 154-CM stainless steel with a plain edge. Like each of the Pro-Tech knives, the blade snaps out amazingly fast and the lock up is nice and tight. The knife also features a pocket clip. Each Pro-Tech knife, this one included, has that quality look you typically find in custom shops. This knife, the Godson PT704, is perfect for an every day carry knife or to add to your collection. One thing I especially like about Pro-Tech knives is that you can build a collection around a single style of knife or you can build it around a specific look. For instance, you could collect a variety of different Godson variations–each with a unique inlay material. Or, if you really like the look of this model, with its carbon fiber inlay, you could begin to collect a variety of Pro-Tech knife lines–each with a carbon fiber inlay. Whether you get the Godson as your very first Pro-Tech knife or you get it as an addition to your collection, I do know that you will be amazed and delighted with the quality of your new Pro-Tech knife.